When you walk into the old building behind the church on Polk Street, yes, it looks like any community center building that could use a face lift. But then, when you notice the cots in the back corner, and the tables of folded clothes, the welcome signing signs, and the few young smiling faces you know something more happens here. And then there is the smell of the soap......what? Well, we are at the 8West headquarters. It may not look like much, but they are doing thing for homeless youth that reaches much farther than the beautiful smell of the soap they make there. The 8 West company was born out of the Urban Street Angels organization here in San Diego. The Urban Street Angels have been serving the homeless community here in San Diego. 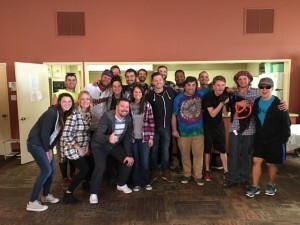 They go out 8 times per month delivering both food and hygiene kits to people in need. That's great, right? Well, they felt they could do more, especially when they were finding that so many of the people in need of their assistance were young adults. 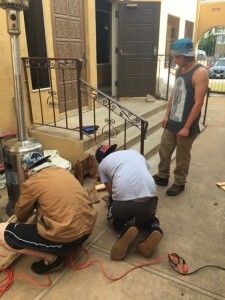 In San Diego, there are over 3,000 homeless young people aged 18-26. Over 3,000 - just here in San Diego!!! That's tragic! There are so many paths to homelessness at that age. It can range from having escaped an abusive household when they were younger, to having lost a job and not being able to support themselves, to having the parents abandon them, to having been raised by a homeless parent, to having "aged out" of the foster care system without knowledge or access to transitional aged youth (TAY) services. 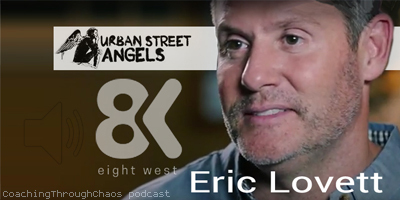 When Eric Lovett, the Founder and Executive Director of Urban Street Angels started noticing this trend of young people living on the streets, he wanted to do more......but what? It started with him opening up his own home to a few of the young men to give them shelter and a place to call home. Then he would try to connect them to jobs in the community. This task, however beneficial to those few he could personally assist, was overwhelming when he thought of the need of all the other young people living on the streets. He wanted to help solve the problem, not patch it with a band-aid. He knew he needed to help find a way for these young people to not only have a place to call home, but he wanted to be able to provide them with job skills that would be not only practical but would also give them a sense of pride. He ran through a few different actual business ideas with his colleagues and eventually decided on forming a company that would make beautiful soaps and be contained within a sustainable business model. Out of this idea, the 8West company was born. The youth would get housing and food and would work at the soap company to learn the trade skills and the business skills they could use in their future life. 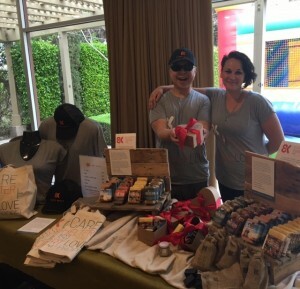 8 West team members showing off their fabulous retail items: soaps, baseball caps and canvas totes. What does the 8 West company look like now? Through the sales of their soap and some generous donations, they now have 2 homes for the 18-26 year old young people in need. They can now house 12 young adults- 6 female and 6 male. Eric also found that there were not a lot of TAY programs that were universally accepting of all people. He found that there was a strong need for a program that would be welcoming to the LGBT (& all other identifiers) community. He made sure that 8West was that place. 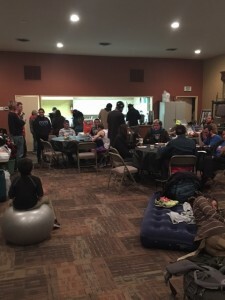 Once a week, there is an open shelter night where those in need who they just don't have the capacity to house can come and sleep, get some hygiene products, clothing, and dog food (a high percentage of the transitional age youth on the streets have dogs - sometimes for protection, other times for companionship) among other things. People are getting hat they need during the weekly shelter night. 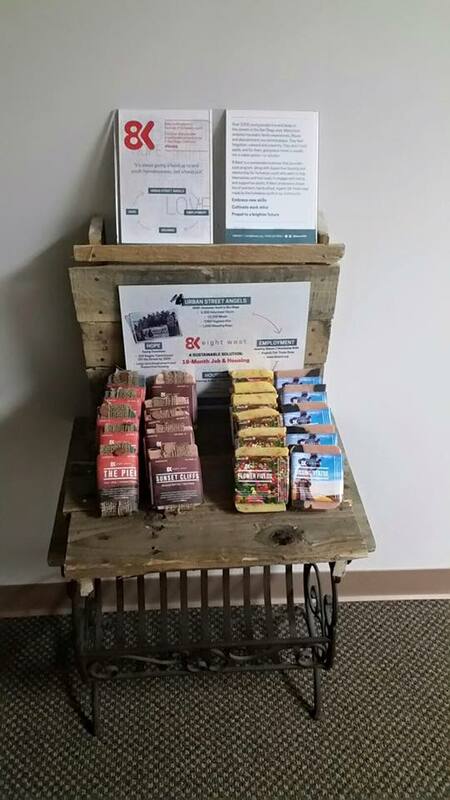 A few 8 West team members creating the custom soap displays from reclaimed lumber. The house residents make the soap a few days a week. Many of them also hold other community-based jobs as they work on saving money to try to make the most of their 9 month stay in the house. Each bar of soap is beautifully wrapped with a custom label. Each soap has a distinct name that is reflective of a San Diego landmark: The Kissing Statue, Sunset Cliffs, Pirates Cove, The Pier, Orchard Avenue, and my personal favorite, Flower Fields. These young people learn about making the soap, marketing, cost pricing, ordering supplies, distribution and all other aspects that go into this business. Eric and his team are on track to continue to open new houses in San Diego, but this progress does not come easy. He has plans to double the amount of residential beds in the next year. After that, well, he's love to one day be able to provide housing and skills to ANY homeless youth that needs it. But it can only happen with community support. That's where you can come in. This business survives and grows only through it's soap sales or through direct donations. The shelter is in the same building as where the soap is made. 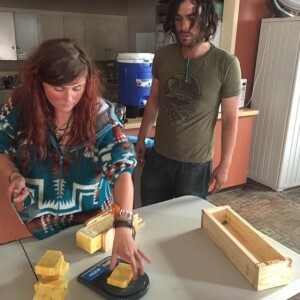 For now, they are making very good use of the space they have, but as they grow, they will eventually need a larger working facility in which to make the soap. You can even buy the soap online. Their online retail shop even includes baseball caps and fashionable canvas tote bags. From a bar of soap to a large contribution, every bit of support helps. What if your not in San Diego? In my interview with Eric, he's quick to point out that they are not talking with me only to promote and help 8 West's efforts to end youth homelessness in San Diego. No, he wants to help raise awareness of the overall problem of the homeless youth in our country. You may not see them everyday, but know that there are homeless people ages 18-26 in most metropolitan communities. Eric wants you to become aware of who is living on the streets in your community and what organizations can you connect with in your own community to help end this staggering problem. 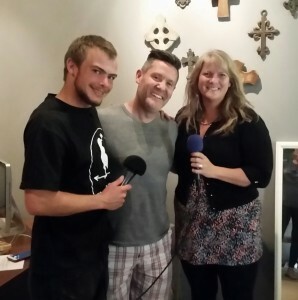 Me, Eric Lovett (center) and 8 West resident Nick- you can hear his story in my podcast interview. Sometimes we never know how or when we will be struck by emotional lightning. I was struck the day I discovered the 8West. I had recently begin talking about some hard times in my young life that caused me to leave home at 17, just before high school graduation (you can listen to that interview here on the School of Psych Podcast). Due to unfortunate circumstances and no where to turn that felt safe, I ended up homeless and living in my car for about 3 weeks. I was ashamed. I was depressed. I thought I was worthless. And that was only my experience of 3 weeks on the street! Imagine the young people who are on the street for months, or even years. With my own past at the forefront of my recent thoughts, I wanted to find out what was close to me here in San Diego. I discovered the 8West video on YouTube. I knew, that moment, that I needed to get involved with this organization. I emailed them through their website at about 6:30am. Eric responded almost immediately. When we met, I couldn't help but feel choked up for the girl I was at 17 with no one to turn to. I wished there was a place I could've escaped to. Knowing that 8 West exists here in my own community is healing for me personally - to know that our culture has evolved enough to recognize that these types of programs are necessary. They are problem solving in ways not thought of before. Here at Coaching Through Chaos, I've made it my personal mission to help support them in any way I can - to give them a voice through the podcast interview, to help fund raise through sales of the soaps in my office, and to enlist my team of clinicians to donate time and services as needed to the young adults in the program. I feel compelled to help. I hope this interview inspires you to help in your own way in your community. 2. The 8West YouTube video that inspired me to contact them. 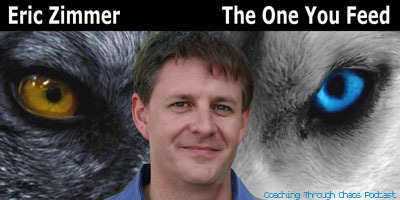 Do you know the Cherokee parable about “The Two Wolves”? A grandfather is teaching his grandson about life. “A fight is going on inside me,” he said to the boy. My guest today is Eric Zimmer. Eric and his best buddy, Chris Frobes started The One You Feed podcast in early 2014 and it has quickly risen in popularity. The One You Feed features guests each week who educate the audience through their conversation with Eric. The conversations always start with a question about how the guest's internal good and bad wolf influences them. He's had experts in the fields of neurosciences, mindfulness, spirituality, wellness and personal fitness on. They are 96 episodes in an counting with close to 2 million downloads. That being said, maybe you don't need to be told any of this because you're already a fan. "The One You Feed" podcast was rated #1 by iTunes in 2014. That's great and all , but why is Eric on The Coaching Through Chaos Podcast? Don't I feature people who will "inspire, motivate and empower you"? Well, in fact, this episode marks the first in what will be a recurring series of episodes in which I bring a story of resiliency and triumph over life's hardships, losses or mishaps. Eric has a story to tell that I think is worth hearing. Eric's life took him from the depths of despair and homeless in his addiction to entrepreneurship and now to a place of bringing help, and hope, to others. Eric has come a long way in his life and he demonstrates a resiliency and self-awareness that seems to keep him in check. He won't forget where he came from and he can appreciate how far he's come. It was my pleasure to converse with him on The Coaching Through Chaos Podcast. Few species are as historically vilified, as ecologically valued, and as continually controversial as wolves. Despite the vital role they play in many of our native ecosystems, wolves were nearly eliminated in the U.S. by relentless hunting and predator control programs determined to wipe them out. This interview was released to coincide with National Wolf Awareness Week (the third week in October), a time set aside to celebrate these important animals, highlight the threats to their survival, and spread the word about what can be done to help wolves stay protected and help humans learn to live alongside them. 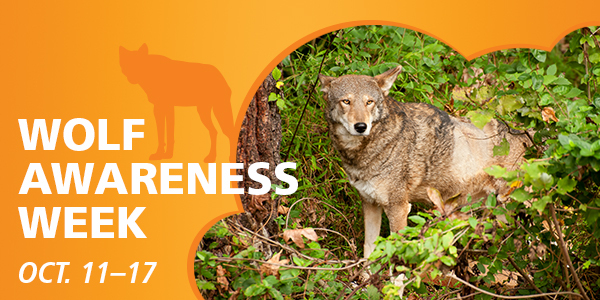 Find out more at Defenders of Wildlife. Life can throw a lot of hardships in our paths, which it seems only the mentally strong can withstand... Following tragic losses in her life, Amy Morin LCSW wrote a list to remind herself how to keep going. Shared on lifehack.org, the list went viral, then flooded Forbes. Like a beacon in the night, Amy's worldwide best-selling book, 13 Things Mentally Strong People Don’t Do, gives us all simple lessons in resiliency in a world where adversity can leave us feeling isolated..
Amy’s life was going along pretty well. But, when she was 22, her mother died suddenly of a brain aneurism. Her mother was only in her early 50’s. Most people aren’t ready to lost their parents even if they pass away much older, but no one expects their parents to die that young. That’s just not supposed to happen! Amy was healing from that though. She was young in her career as a clinical social worker, was married and starting her life with her husband. But then, on the 3rd anniversary of her mother's death, her 26 year old husband died of a heart attack. What?!? As Amy put the pieces of her life together. She found a way to honor her young husband’s memory. Every year on his birthday, she would get together with his family and participate in life-affirming experiences. Sometimes they were adventurous trips, other times, they were more subdued, but they always made it fun and didn’t wallow in his loss. They found a way to see through the pain of the loss to celebrate life: his and theirs. Then, a few years later, Amy found love again and got remarried. She and her new husband were enjoying the early days of this marriage and looking forward to their life together. But then, tragedy struck yet again. This time, her new father-in-law was diagnosed with untreatable cancer. She was then faced with the anticipation of the loss of someone else she was close to – as well as the anticipation of having to help her new husband cope with the loss of his parent. The pain she, of course, knew all too well. This is when Amy decided she was really going to have to pull from all the mental strength she could find. Amy initially wrote the original list of “13 Things…” for herself. She speaks of doing it as a reminder to herself of how to successfully cope. She was working as a therapist and was good at helping others find their mental strength, but she discovered that focusing on what to do worked for a while, but she found “not so healthy” habits creeping in to sabotage her. The list helped her understand that she would/could survive these losses. Then, she realized others might benefit from the list and this is when the list took on a life of its’ own. She posted the article on Lifehack.org (you can read it here ). The list went viral within a few hours. The traffic generated from the article shut the page down! It was then re-posted on several other sites, including Forbes.com where it set a record at over 10 million views! To this day, it is still one of their most viral posts. It was after all this web attention, that Amy was approached by Harper Collins publishing house and asked to turn the list into a book. So, that’s exactly what she did. The book went on to become a bestseller. I think many people related to her story of strength and perseverance and found her advice practical and actionable. 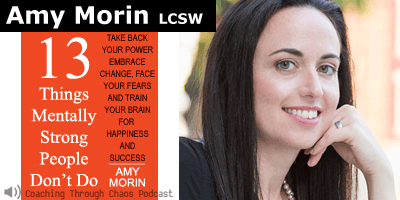 Amy talks of our mental capabilities as a muscle that can be exercised and strengthened. I also subscribe to this thinking. One of my favorite things to work on with my clients is helping them build their mental strengths, or resiliency traits. We are all born with part of our personality predetermined by our genetics. How the other part of our personality developed is thought to be determined by how we are nurtured. As we are growing up, we receive certain messages about how we should or shouldn’t deal with stress, upset, disappointment, as well as love, happiness and all the rest of our emotions. Those messages are internalized and stored as fact, even if they are not in our best interest. For instance, I learned as a child that when I am stressed out I should eat to make myself feel better, which led to a struggle with weight as an adult due to my engagement int his self-soothing behavior. I've had to learn to fight against what fact that although not true, nor in my best interest. Amy Morin’s “13 Things Mentally Strong People Don’t Do” takes a refreshing spin on how to overcome struggle and, in her case, multiple losses. Amy’s list resonates with many of us I believe because collectively we have been focusing on what “to do” or what we “should do”. When we don’t “do” what we are “supposed to do to be healthy”, we end up feeling like a failure. However, Amy’s list focuses on “what not to do”. Such a different way of thinking! I say this because when we twist up, say, #11. “They don’t fear time alone” into the “You should do this” type of list, it becomes “They are comfortable being alone”. Somehow not fearing something feels much different than “you should be comfortable” with something. That way of thinking can set many people up for failure. I believe if we re-wrote the list from the “what to do” perspective, it would start to sound like “Mentally strong people just do more then you when you are tired of trying”. Not very empowering. Strengthening those emotional muscles to help you become stranger and more resilient takes active work. I’ll leave you with this. The work can be tough, but if your perspective is accepting and forgiving of yourself, reminding yourself of what not to do can feel achievable.